When we started the Beer O’clock Show in 2012 the ambition was for Steve to take Mark on a journey through beer. 150+ main shows, spin offs & minisodes later, we’ve achieved the original aim. Golden ales, lagers, bitters, stouts, powl owls, sours, saisons and of course, IPAs have all fallen in our wake as we’ve continued on our beery journey. 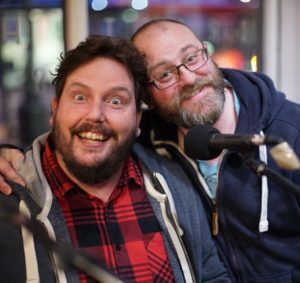 So its with a heavy heart that we are sad to announce that the current season of the Beer O’clock Show will be our last as Mark hangs up his headphones having sampled maybe one too many barrel aged beers. The final episode of season 10 will be our penultimate show and will followed by the End of The Road live party at Hop Burns & Black that will include our collaboration beers with Elusive Brew and Northern Monk. What does the future hold? We’ll be continuing with Flavour of the Month for the time being as we enjoy sampling the latest releases courtesy of Little Leeds Beer House. Steve will also be back with something new in September which we’ll announce at the End of The Road party at Hop Burns & Black. It’s been a blast, we’ve met so many great people along the road and are grateful of the support from every listener, follower, supplier, bottle shop and brewery. Thank you all, you’ve all been amazing. Congrats to Mark for completing his journey and his quest!